A tender design for the perfect trifold brochure – Ideal for any photography business! Delicate flower design for the perfect trifold brochure template! Want to promote your business in an easy and cost-effective way? 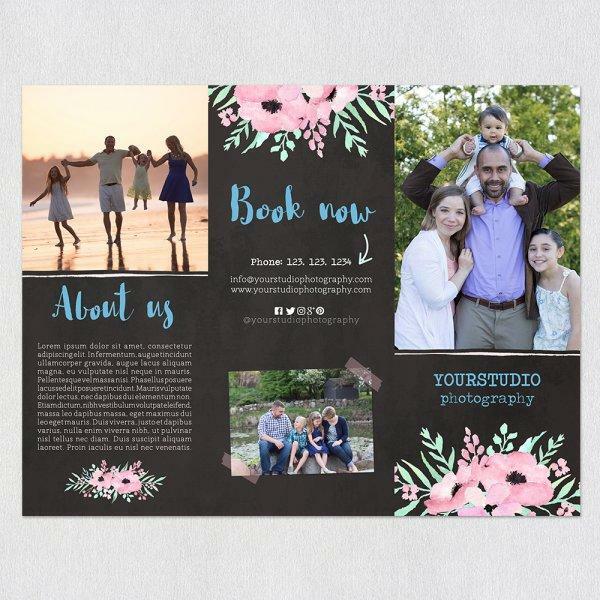 Well, while marketing could be an expensive endeavor, the use of ready-made and customizable tri-fold brochure templates can take the stress out of the process and help you spread a word about your business within a matter of minutes. The beauty of this kind of templates is that they are already designed for you and all the hassle of a graphic designer already taken care of thus cutting down on time and cost needed to do all the “dirty work.” You can choose a template that best suit you from a list of cute and exceptional designs from Sleeklens and watch as your business grows both in income and popularity. They say that you shouldn’t celebrate your chicks before they are hatched but that does not apply to your business marketing strategies. 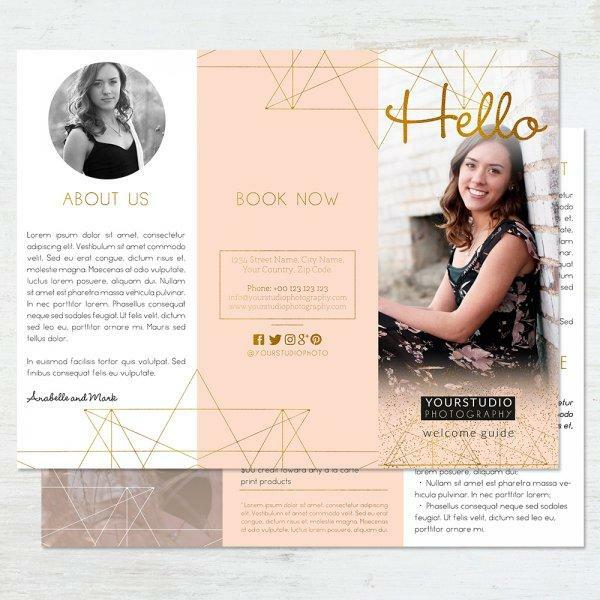 You can easily gauge the success of your marketing by simply looking at the methods used and using the customizable tri-fold brochure template like this one will definitely translate into great Return on Investment. Celebrate is a cost-effective 38 by 13 centimeter template that comes with easily captivating colors and the design is just but unique and irresistible. By using the tri-fold brochure template, you will be guaranteed of slashed expenses since you do not have to hire a graphic designer and all your material can either be shared digitally or printed in any of the printing labs near you. The template comes with clipping masks to help you add and edit your images and logo in a very simple way. Even if you aren’t skilled as a designer, using this template will be a breeze thanks to the provided instructions which are included in your download. This template is just as the name does suggest. 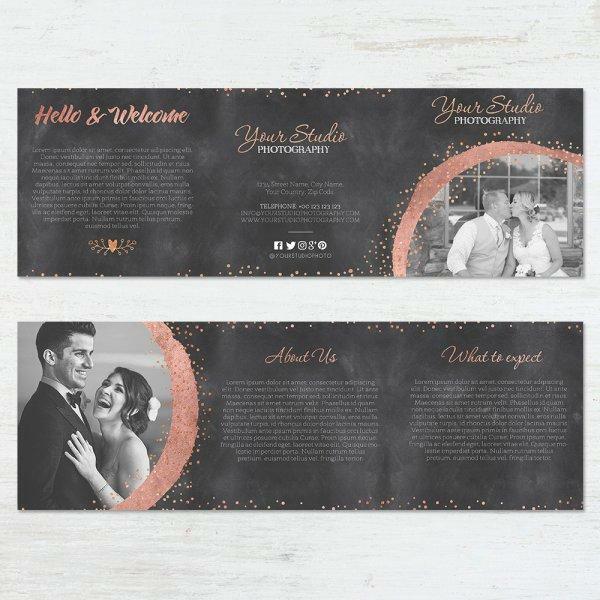 It offers a cute layout with which you can work with as you design your tri-fold brochures ready for distribution wherever you go. Whether attending a party or a wedding, you can now promote your business hassle-free by handing over brochures which you aren’t ashamed of. The template has a sweet blend of pink shades and you will receive instructions to help you get started as you design your photography marketing material. You can use the template for your studio or designer brochures for your clients thus getting an opportunity to earn extra money besides your normal business. This template works with Windows and Mac and is compatible with Adobe Photoshop CC, CS+ and Elements 6+. The text is completely editable and you will also receive a list of fonts you can download and use in your customization. Just create cool brochures and distribute them in emails, via social media or print them in one of the big pro labs any time. You understand how hard it is to shake off the thoughts and memories of a cheerful evening spent with family and loved ones. Well, with this template, you can create brochures which are not easily forgettable and inscribe your studio name strongly in the minds of those who come across them. The brochure template is cute and comes with a combination of elegant colors which are easy to use in all your marketing campaigns. The background has been carefully chosen to give you something that will cut it in the market that is crowded and full of competition. As the saying goes, the very first impression really counts and this is what the template is designed to help you do as you reach out to the thousands of customers out there. 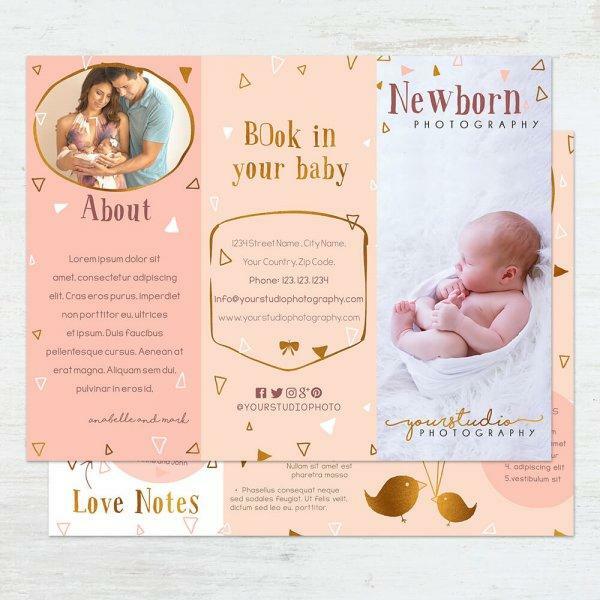 Just imagine what you could achieve if every potential customer seeking for a reliable photographer came across a convincing brochure that is flawlessly designed? You can achieve that with this 38 by 13 centimeter tri-fold brochure template. Customization can be done in a matter of minutes and you can completely edit the text and add your images with the help of the clipping masks. Just enjoy a cost-effective and effortless marketing strategy and transform your studio into a busy hub. Who doesn’t love the scent and beauty of a colorful flower garden? We all do and this template can help you duplicate the beauty of a well tended flower garden. The template has a dimension of 38 by 13 centimeters and offers 2 file options, front and back, thus giving you ample space to express your message with your audience in mind. You can use this template to reach different kinds of people with different messages while at the same time keeping your expenses down and affordable. You do not need multiple templates to design brochures with different images and messages. With this one template, you can reach thousands of people with printed brochures or even send them digitally through the social media or emails. This template comes in Layered Photoshop (PSD) files of 300 dpi and offers some easy to use tools such as clipping masks (for adding and resizing your images in simplicity), a list of fonts (these can be downloaded freely from the internet and are not included due to copyright laws) and instructions to help you install and get started. All you need is a Mac or Windows plus the compatible Adobe Photoshop software. Flower garden works with Adobe Photoshop version CS+, Photoshop CC and Photoshop Elements 6+.